Opera/classically-trained duo Sidney York eschew traditional paths for orchestral-inspired avant-pop. They play Zaphod’s on Feb. 22. In this edition of the Weekender: Jennifer Dickson, Newfoundland Kitchen Party, Sidney York, and three other things to do in Ottawa this weekend. They’re not meant to be in protest. Nor are they intended to be hostile or indifferent. Instead, Danièle Rochon’s works in Fragile are a conversation; one between the two, or, in her words, “visual dialogue between man and nature, between its fragility and its constant aggression.” Her exhibit at Galerie St-Laurent + Hill display works on this theme. They also draw on her years of experience, her world travels, and her fascination with light; the latter often revealing “intimate hidden secrets.” The vernissage for the show is on Thursday, February 20 at the gallery, which is located at 293 Dalhousie Street, from 5 p.m. to 8 p.m. Fragile is on until March 5. Fountains, trickling streams, pools — water is often a key element in gardens. It’s also one of Jennifer Dickson’s fascinations. Wallack Galleries exhibits key works by the renowned Ottawa artist from Friday, February 21 to Saturday, March 8. The show, Giochi d’Acqua, presents pieces spanning her 60-year-career, but focusing on her interest in water as a feature of gardens. It will also showcase 12 recent works that touch on the subject of water games. A vernissage for the exhibit takes place on Friday, February 21 from 7 p.m. to 9 p.m. Dickson will also be giving a series of talks regarding the works on Saturday afternoons (Feb 22, March 1 & 8) at 2:30 p.m.
Lips chapped? Moisten those smackers and pucker up to kiss-the-cod for what will most certainly be a highlight during the Rock-themed Kitchen Party on Saturday, February 22. The event is in celebration of Bruce House’s 25th anniversary, a residential care-home for people suffering with HIV/AIDS. Led by former TV-personality and proud Newfoundlander Kurt Stoodley, the Newfoundland Kitchen Party will feature (along with the aforementioned “cod” ritual) a Screeching-in ceremony (Screech is a Newfoundland rum, a mainstay of The Rock’s traditional diet), whisky (including maple whisky! ), rum and beer tastings, local culinary treats by various renowned chefs, music by the DW James Band, a silent auction, and door prizes. The event is from 7 p.m. to midnight at The Glebe Community Centre, 175 Third Ave. Tickets are $70. Is opera dead? Or is it just finding new life in contemporary music? Certainly Toronto’s Austra, whose vocalist is opera-trained, suggests that this may be the case. Add to that list Sidney York. 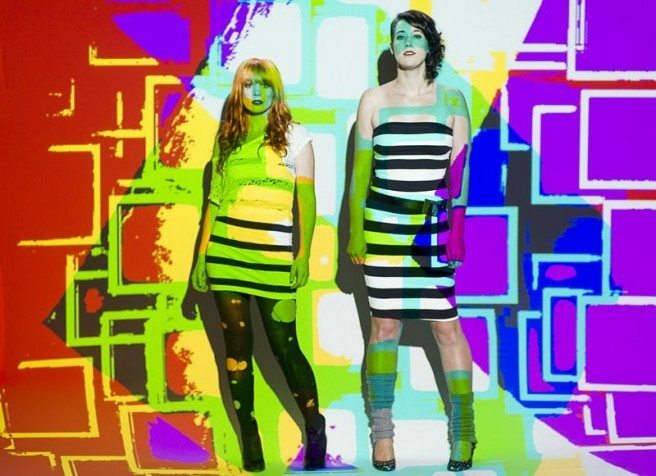 The band’s lead vocalist, Brandi Sidoryk, has her roots in opera, while her partner, Krista Wodelet, is classically-trained — and yet this Canadian duo have eschewed classic directions and instead chose to make glitzy, avant-pop; polished, pop-structured songs, but with sounds typically associated with the orchestra pit. Having just released their second album, <3s (Hearts), they are playing on Saturday, February 22 at Zaphod’s with Kashka. Advance tickets $10. Doors open at 8 p.m. Zaphod’s is at 27 York St.
For a fifth year in a row, Wakefield village is hosting its documentary film festival. On until the weekend of March 8-9, the Wakefield International Film Festival will feature a coupling of films over several weekends. This Saturday and Sunday, February 22 & 23, the festival features two films: The Moo Man and Dirty Wars. The first is a heartfelt, but comedic look at a British dairy farmers’ struggle to remain small, choosing to stay close to his herd of cows instead of going bigger and becoming just another supplier to the supermarkets. The film, directed by Heike Bachelier and Andy Heathcote, was nominated for best U.K. documentary. The second is an award-winning documentary that investigates a secretive military strike force that does not exist on paper. Directed by Rick Rowley, the film follows investigative journalist Jeremy Schahill as he looks at the Joint Special Operations Command’s clandestine operations — from Afghanistan to Somalia, and beyond — and its targets on their “kill list.” The Moo Man and Dirty Wars, will be screened both nights at 5 p.m. and at 7:30 p.m., respectively. Individual tickets are $10; a weekend pass is $18. The venue is the Wakefield Community Centre, 38 Valley Drive, Wakefield, Quebec. Agnes Obel — this Danish singer/songwriter is a musical rarity. Drawing from such diverse influences as Bartok and Chopin, PJ Harvey to Claude DeBussy, Obel’s melancholic balladry is a combination of profound musicianship, artistry, and uniqueness. She’ll play with Ottawa’s Her Harbour (think Regina Spektor) — it’s a perfect pairing, which is why the show — Sunday, February 23 at The Black Sheep Inn — will undoubtedly be an intimate and unforgettable evening. Advance tickets are $20. The Black Sheep Inn is located at 753 Riverside Drive, Wakefield, Quebec.